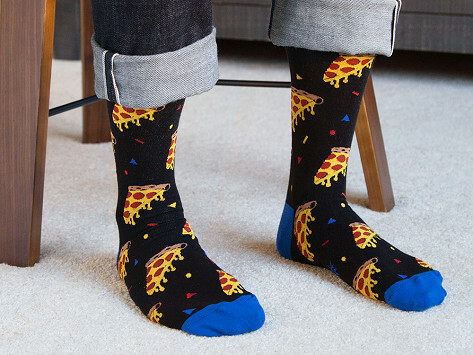 These aren’t simply funny socks—they’re colorful, personality-filled, soft, and stretchy socks. The amazingly offbeat patterns are just begging to be shown off. Dimensions: 0.5" x 3.5" x 12.5"
My grandson loves crazy socks. These were crazy enough, and well made. He loved them! gave them to Dad as stocking stuffer.... he's kinda porky Merry Christmas. My grandson loves crazy socks so bought him two pair from your collection for his twenty second birthday. He immediately started planning when and where he would wear them.